Stainless steel screw receptacles provide a firm anchoring of probes to wedges. Lateral electronic scanning replaces the hand-skewing movement (with lateral wedges). The IHC wedge option can be ordered to improve the quality of the inspection: irrigation, mounting holes for the wedge holder to work with any Olympus scanner, and carbide pins to increase wear resistance. Wedges are designed to perform manual or automated scans. Custom wedges with specific refracted angles can be ordered; wedge shape and contour can also be customized. * Below 4 in., IHC are integrated in the Rexolite and wedges are not compatible with IHC rings. Flat wedge can be used for pipes greater than 12.75 in. OD. Find the appropriate wedge in either the OmniScan or TomoView Wedge Database. Parameters are automatically set once the wedge model is chosen. If the wedge is not already in the database, you may download the latest database update from the Service & Support section of www.olympus-ims.com. 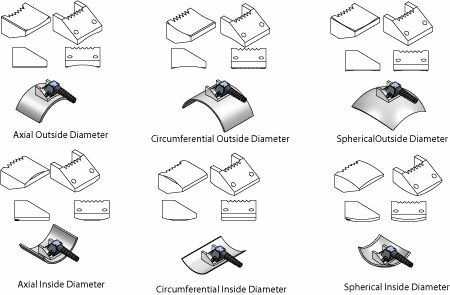 Enter the parameters manually using the values provided on the Wedge Specification Sheet accompanying the wedge. Call your local sales representative.